Sidescrolling, multiplayer co-op/pvp, monsters, loot (bows, swords, pickaxes), NPCs, Dungeon-Diving, Boss Fights, more loot (guns, light-sabers, fireflowers), crafting, building, Wings, random events, epic loot (miniguns, wings, flamethrowers, angelic armor), and mods to make whatever else you want. But honestly, what more could you possibly want? 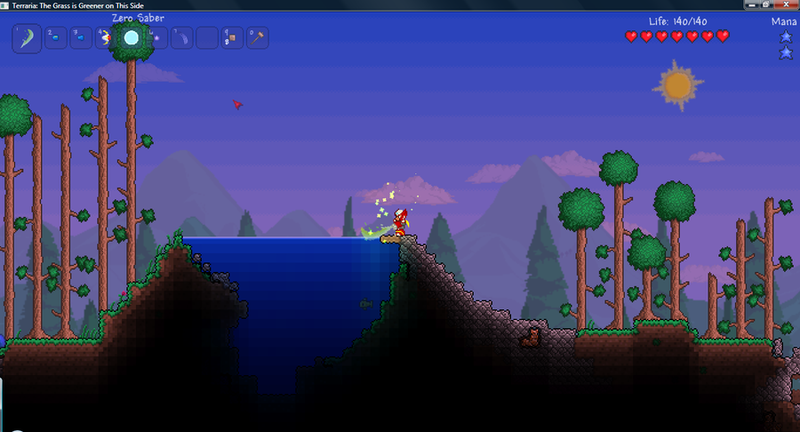 Terraria is a $10 game on Steam which is well-worth the buy. I'd gladly jump on and help anyone interested get started. You start off with a copper short-sword, a copper hatchet, and a copper pickaxe. 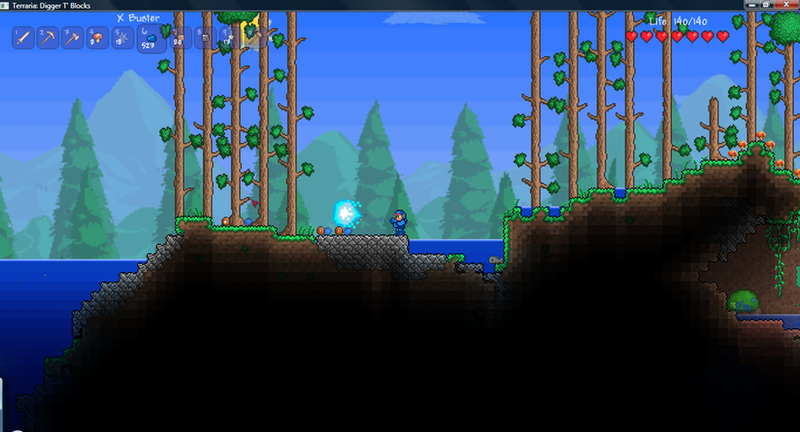 You'll be spawned around the middle of your map beside a Guide NPC. Your first objective: make a house. The tools at your disposal can break most of the blocks around you to allow landscaping, then you just start placing some wood or stone around you and get the house started. By hitting your esc key, you bring up your inventory/crafting screen where you'll find (if you have enough wood) there's a crafting table you can build. pull this out and plop it down in the house for your first crafted item. By this time, you'll have noticed some bouncy little green or blue slimes have jumped on-screen. You'll want to deal with them. Lo-and-behold, they drop loots (a few copper coins and some gel). Note: at any time you can ask your guide (assuming he's alive) what you should be doing next/what items you can make from materials. For your awareness, Gel can be combined with wood to make torches, and with the sun setting, you want some light. Some items require you to be standing next to your crafting table, however, torches and other things do not. Afterwards, grab a bit more wood, use your table to craft a door or two, make a chair and put it beside your table, then add some torches. You'll also need back-walls for your house to be complete, these can be made from your crafting table as well. After covering your back-wall, the house becomes "suitable housing" and your Guide will claim it as his home/stand there at night. Now the sun is gone and the music has changed, you noted a few seconds later, you're seeing eyeballs flying through the air and zombies outside your door, and yes, if you go out there, they will kill you rather quickly. Just wait patiently through the night, don't worry, unless it's a 'blood-moon' outside, they can't break the door down no matter how hard they try. After the first night, your primary objective should be to gather metals. Go forth across the landscape looking for copper and iron if you want, or go find a cavern and delve deep into the land for more risk but higher rewards, you may even come across a treasure chest or two on your way (just be sure to craft a hammer to bring with you so you can smash it and take it with you for later storage back at home). As you build houses, more NPCs will move in (other criteria must be filled first however, like owning a firearm causes the Arms Dealer to appear, have a certain amount of HP and the Nurse appears. Where as some NPCs are randomly located throughout your adventures, like the Mechanic waiting to be rescued from the dungeon, and the Goblin Tinkerer who randomly spawns underground after your first "Goblin Army" event. All in All, I give this game a 9/10 and am always willing to give it a go if anyone else wants to. By the way, I'm also making Megaman mods to this game as an added bonus, so if anyone is interested in that, give me a heads up. Is this the one you were telling me about? About the dragon that tried to eat you or something? I would like to play with you when I get my new laptop and internet. Would you play with me? No, that was probably Skyrim I was talking about. Also a very fun game, but not multiplayer. Yes, I'd love getting you started on Terraria. Let me know when you get your internet set back up and download Steam. I could have sworn it was this one because I remember hearing about the zombies that tried to take down your door. Anyways, I will get it here in a little bit.